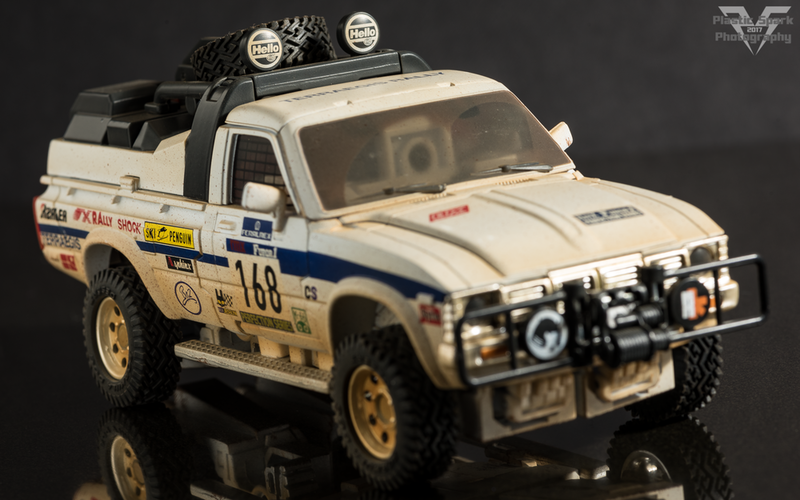 While I ended up passing my original Terraegis along to a friend after reviewing, I absolutely had to get my hands on one of these rally versions. I really love the truck mode for this figure and all the rally accessories really are the cherry on the cake. The weathering is incredible as well. They even covered the windshield in muck and have clear spots where the wipers have cleaned it off! The #1 reason however, that I wanted to pick up one of these toys, is to show my support for my friends! MMC is one of only a handful of companies who publicly credits a lot of their contributors whether it be designers, sculptors, photographers or packaging designers. There's a ton of liveries on this figure referencing various MMC and Ocular Max products, as well as logos and references to contributors who work with MMC. While I recognize most of the logos and references, I wanted to draw attention to two of them in particular: HardReturn (The silhouette on the front bars) and U.NEM Studios (Red lettering on the drivers side) are fellow toy photographers and friends of mine. They have been very supportive of my work and this page for a long time so I felt it only appropriate to show my support to them by adding this toy to my shelf. It would be awesome to see my logo lined up with so many other incredible people one day! A guy can dream right? :) Anyways, thanks for sitting through this ramble session, hope you enjoy the photos!